PRIAM provides solutions for fulfilment houses and call centres. PRIAM is a fully integrated business system with a multi-client architecture that is ideal for the fulfilment house business model. In today's rapidly changing environment, speed and flexibility of response are the key to providing a truly successful customer experience. With unrivalled functionality, its ability to handle niche markets and completely flexible setup, PRIAM is able to adapt to rapidly changing customer requirements. However, even the most comprehensive of systems will occasionally require bespoke development. PRIAM is also a software house and we have a number of experienced technicians who are able to provide bespoke developments around the PRIAM system. Finally we pride ourselves in our ability to work in partnership with our fulfilment house clients. We feel that the success of our fulfilment house customers is core to our business and we work together to provide solutions for our customers clients. PRIAM has been developed to handle many different types of processing and markets. These include areas such as fashion, book retailing & book clubs, music publishing & royalties, mobile phones, charities, membership and subscriptions. With PRIAM's comprehensive range of functionality a fulfilment house need never turn away a prospective customer. Can be an area of weakness in what the fulfilment house can offer. PRIAM has a number of different reporting options that can be tailored to the clients requirements. PRIAM provides a huge number of standard reports covering all areas of the system. These reports can be scheduled to run on a regular (reoccurring) basis and then emailed automatically to the client whenever they are required. PRIAM offers a product called WebView. This offers client reporting over the Internet. As long as the client can access the Internet they can view and / or download their management reports. There is unrivalled access into the database to allow the fulfilment house to create their own reports via ODBC reporting tools such as Crystal Reports. Today there is a huge emphasis on providing timely, accurate CRM information to call centre operators. The integrated nature of PRIAM's solution allows you to provide your clients with exactly the information they need to provide a first class 'customer experience'. Combining powerful modules for contact management, customer services, workflow, call scripting and email management into a single area, PRIAM is the ideal solution for your call centre. 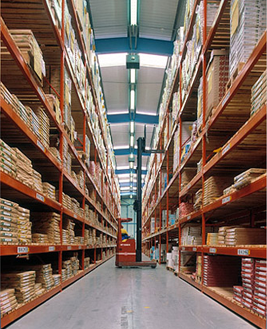 PRIAM offers unrivalled functionality in the area of stock handling and warehouse management. We have multiple options for goods inwards processes, put away and picking that are often not found in much larger (more expensive) WMS packages. PRIAM is offered with the Caché database from Intersystems. The Caché database offers unrivalled performance with the ability to process many thousands of on-line transactions simultaneously and maintain very large data-sets. Moreover the Caché database provides unrivalled access to the clients data via an SQL front-end and data dictionary. PRIAM has a fully integrated eCommerce platform and content management system. This allows the fulfilment house to offer a full eCommerce solution to their client or alternatively use the PRIAM facilities to import and export data to and from the clients own eCommerce systems.